The Christmas sewing is done. I hadn't planned to do any sewing past that this weekend, but my husband is sick and spent yesterday evening in a niquil coma. So, I was happy to get a couple of projects cut and ready to go. After I got home from the office today, he had fallen asleep again! So I took advantage and did a quick little project. 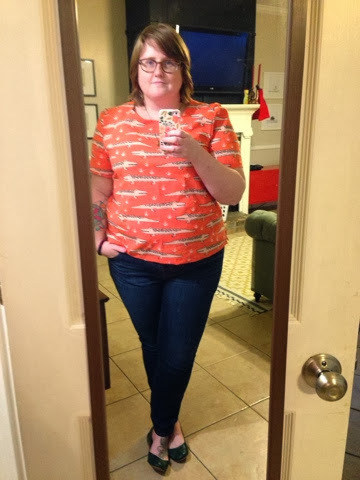 I can definitely see myself using this pattern a LOT since I've figured out the fit issues. I read a lot of reviews of this one online, and heard that it was extremely boxy, with way too much ease in the waist. 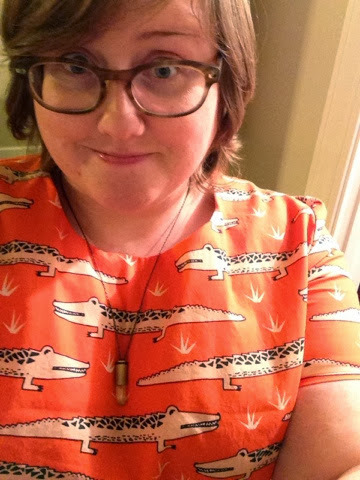 So I kept those thoughts in mind and compared the pattern to a shirt I had that fits me well. I ended up cutting roughly two sizes smaller than what I measured in the waist and bust. 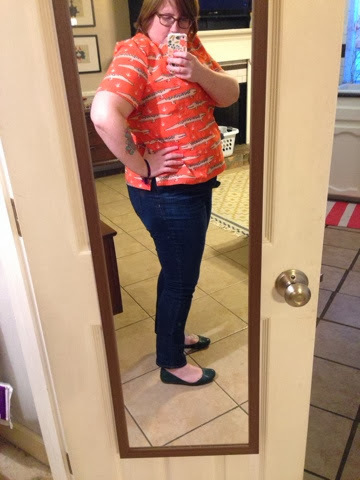 In the hips, I stuck with my normal size, which I think worked really well. I also lengthened the sleeves a bit. I cut them the same, but I just did a very short hem so they were a little bit longer. I think my favorite thing about this make was that it used facing to finish the neck opening. I like the clean look here, and I think it works really well with the style. The sleeveless versions of the top also use facing instead of bias tape. The star of this project is really the fabric. It's from spoonflower and the designer is andrea_lauren. She has her shop set with limited selections right now, but she has some really lovely designs. I am totally crazy about the color here. This is the first project I've made that ended up exactly as I envisioned it. I think a lot of that is due to the fact that I really planned out my steps, took my time, and paid attention. I absolutely love it. And I am super psyched about the rest of the projects I have coming up! Overall, I really enjoyed this make and will definitely use this pattern again, maybe with a different neckline?